Tigex Mickey Mouse and Minnie Mouse Teether - Set of 2 | Blue | Gently stimulates amd massages your baby tender gums. Help ease your baby's teething process by getting this set of two teethers. 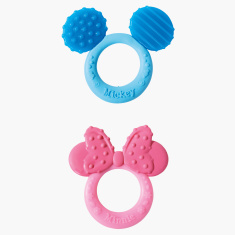 The ear detail of Mickey Mouse and Minnie Mouse looks attractive and are soft and gentle on your baby's tender gums.